For all you Mac users: behold my success at fooling iPhoto into creating a photo collage, something it doesn’t profess to do. There are a number of third-party software choices available to let you do this… but I found a quick, easy and no-cost solution. Just pour your photos into a page template for a new iPhoto book, then save the page as a PDF (using the Print command), and then open the PDF (with Preview) and save it as a JPEG. (Be sure to adjust the picture quality slider bar to Best.) It’s less complicated than it sounds and, provided you know which photos you want to use, can be done in less than a minute. Give it a try! This collage represents a fun thing to do on a rainy day in November: head to your local big-box store and pretend it’s a botanical garden. With no one (except me and Mr. TG, elsewhere in the lumber section) venturing out due to the dull, wet weather, I was free to enjoy the colours and browse plant tags for names and care instructions. No obligation to buy (don’t tell anyone I said so). Shown here, anticlockwise from upper left: One of a table full of Phalaenopsis orchids; the flaming leaves of Croton; the pink bloom of bromeliad Aechmea fasciata; another bromeliad; pots of pheasant’s breast aloe; a row of fiery chrysanthemums; and an assortment of bright cacti. The side trip works best when the plants are freshly arrived, of course. Big-box stores are everywhere, which is convenient for this little outing, but they aren’t known as intensive care units, shall we say. Wow, Helen. What a great little trick. Love the results. And you didn't even have to have Photoshop to do it. A fine collage but (and this is an enormous but) Crotons really should not be allowed anywhere near a civilised photo montage. Sarah, It was one of those "Hmmmm, what if I try *this*" moments. The page layouts for iPhoto books in version 9 provide quite a few options. Gail, Glad you like it. Let me know if any of the instructions are unclear. Diana, I did consider Picasa briefly, but I already have a Flickr site (three, actually, for different purposes), so didn't want to switch. A collage feature is useful when you want to keep image size down on a blog, but feel like posting multiple pictures. I'm relieved to have figured out how to better use the technology I already have. 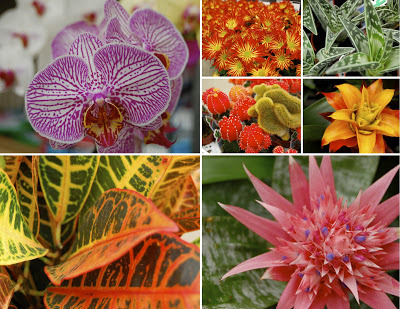 This is a beutiful collages of all the tropical plants that we can grow here too. The pictures are lovely. One of these days, I must try making collage. I still very backward. Sweet. Thanks, Helen. I have a post coming up that calls for a collage and I wasn't sure how to make one (easily). I'll give this a shot in iPhoto.